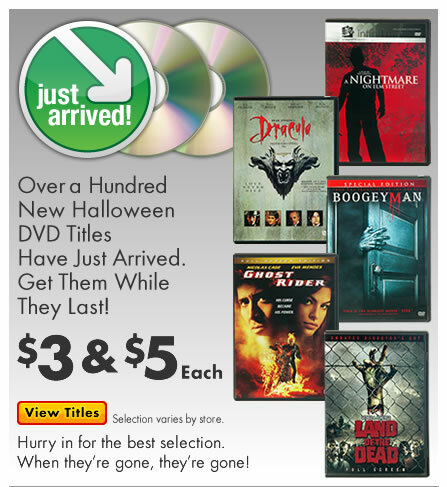 Dr Blood's Video Vault: New Horror DVDs at Big Lots! New Horror DVDs at Big Lots! I just got this in my email so I thought I'd share. Click the image for a PDF of the titles available. With any luck it won't just be a restock of my Big Lots $3 Horror DVD Master List and there will be something new at last. I have now checked and unfortunately there will be hardly anything new apart from a couple of ropey old B movies from the '50s and some horrible Sci-Fi channel dreck. A lot of the films on the Halloween list aren't even horror. You'd think that they would fix the typos before sending something like this out too, wouldn't you?